Amazon has announced a new AWS region in Sydney, Australia with the name ap-southeast-2. The official Ubuntu AMI lookup pages (1, 2) don’t seem to be showing the new location yet, but the official Ubuntu AMI query API does seem to be working, so the new ap-southeast-2 Ubuntu AMIs are available for lookup on Alestic.com. At the top right of most pages on Alestic.com is an “Ubuntu AMIs” section. 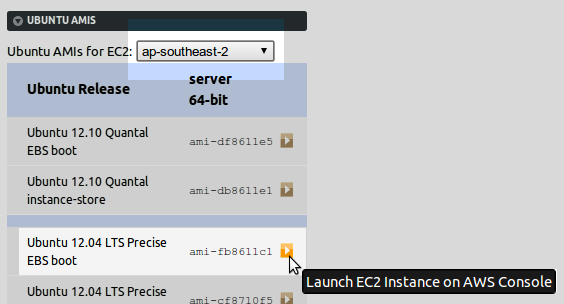 Simply select the EC2 region from the pulldown (say “ap-southeast-2” for Sydney, Australia) and you will see a list of the official 64-bit Ubuntu AMI ids for the various active Ubuntu releases. Both EBS boot and instance-store AMI ids are listed, but I recommend you start with EBS boot AMIs. The AWS console walks you through setting up required ssh keys and security groups and even has a point and click way to ssh to your instance, provided you have Java in your browser (I disable that). where you should always look up and use the most recent AMI id. Make a note of the instance id. where is the public IP address of the instance (does not start with “10.”).